We welcome you to come inside our website and learn more of the history of Afton Villa and its place in the history of the South. 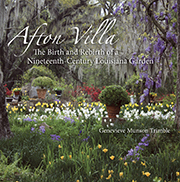 Although a fire in 1963 destroyed the gothic antebellum mansion, the gardens at Afton Villa are among the most famous and picturesque in the state. Beginning in 1972, Genevieve and Morrell Trimble undertook the task of restoring the grounds. Today the estate contains over 20 acres of formal gardens and pleasure grounds, including the famous ruins gardens, a formal parterre garden, a daffodil valley, a historic family cemetery, and more. The cluster of notable 19th century gardens in West Feliciana are outstanding examples of what unlimited time, wealth, labor and horticultural knowledge, combined with rich soil and a happy climate could produce in antebellum culture. These gardens remain monuments to past glories and to their hardiness.